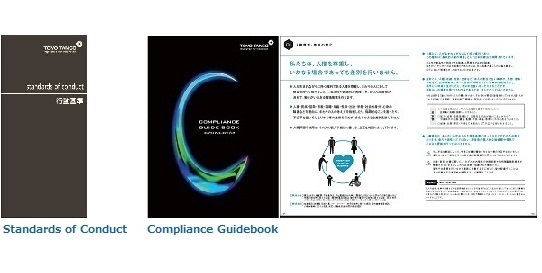 We, Toyo Tanso, make various efforts to enhance employees' awareness of compliance and promote rightful business activities placing a top priority on compliance; observance of laws and regulations in order to develop permanently as a global corporate group. We establish Risk & Compliance Committee to solve various kinds of issues in coordination with several departments in charge of individual risk and reflect their results to corporate activities. We distribute two kinds of brochures, "Standards of Conduct" describing employees' conduct guideline and "Compliance Guidebook" explaining laws and regulations to be observed by employees for the purpose of promoting employees' better understanding, and perform educational activities through "Compliance Driving Leader" selected in each department to implement compliance mind into all departments. These efforts have been spread out to both domestic and foreign affiliate companies so that mind sharing has been driven in the group. In addition, we perform periodically group training for all employees including new and mid-career employees and specific training for officers or managers. We also perform educational activities such as trainings on various kinds of specific issues including export control, information security, mental health, time management or leadership. 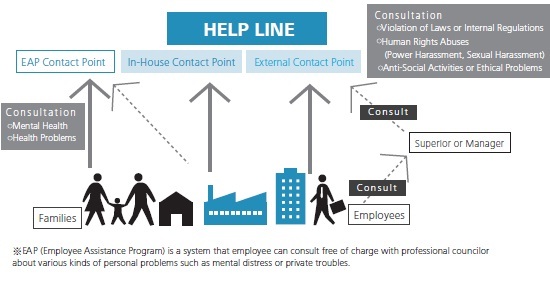 We establish "Help Line" as a contact point to receive consultation about problematic actions or behaviors from the view point of compliance or corporate ethics. We set up two points, both inside and outside company, to receive broad-ranging consultation. We make an appropriate response to consultation after making investigation and examination, and feed its results back to consulter. Copyright (C) Toyo Tanso Co.,Ltd. All Rights Reserved.